Access to a view not available to the general public and clear blue skies are part of the key ingredients when photographing a city’s major icons. 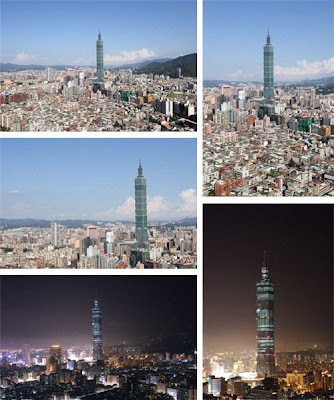 This was the case with Taipei 101 Tower when I was in Taipei a few years ago. I never made it to the top of the skyscraper. The finishing touches were still being put on what was at the time was the world’s tallest building. 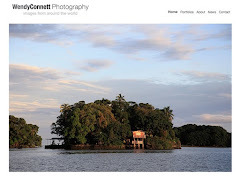 These photographs have appeared in magazines, newspapers, advertisements, brochures and books. Nice! The tower is so tall that the buildings around it look like slums! Thats quite a tall structure..everythg else looks so dwarfed..
Amazing photo...love the fact that it stands out as a single piece. Stunning! I had no idea Tapei had such a towering building. I guess our Sears Tower is way outdated! Hi Wendy! They are wonderful! No wonder they were published.. It's really too bad that you didn't make it to the top of 101 when you were in Taipei. The view is incredible, whether it's day or night. May I ask why? Usually they have tours running all day. Anyways, I just found your blog and wanted to drop in and introduce myself. I'm enjoying your posts on Mexico as my husband and I tied the knot there in December. I'll certainly be back for more! They were just putting the finishing touches on the Tower when I was there so the top wasn't open yet. Glad you are enjoying the Mexico posts. More to come. Congrats on tying the knot.